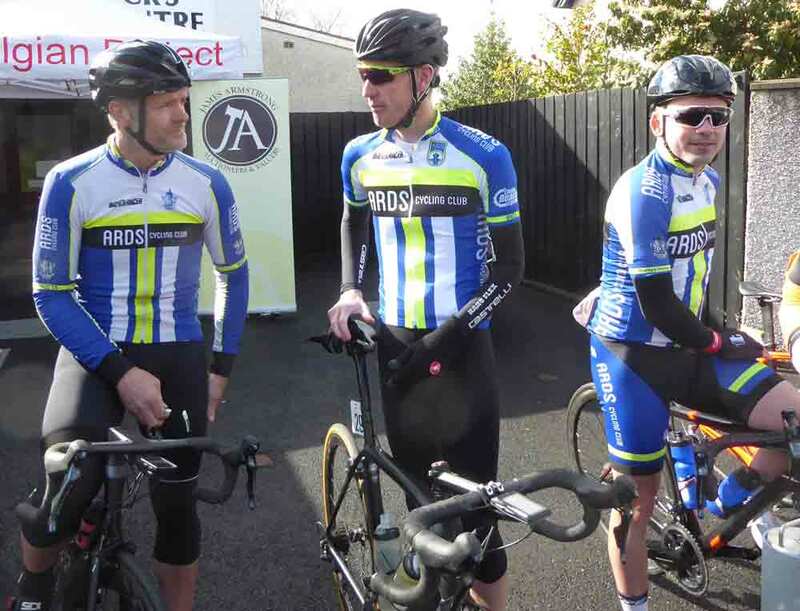 Today saw another great edition of the Tour of Ards, sponsored this year by James Armstrong Auctioneers and Valuers. 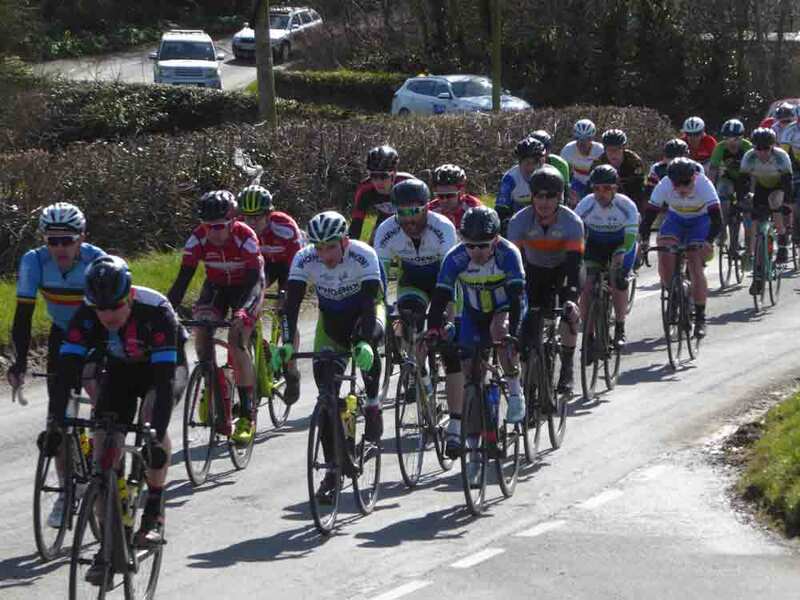 We were blessed with great weather, and the 78 competitors charged round the 87 mile course at over 26mph. 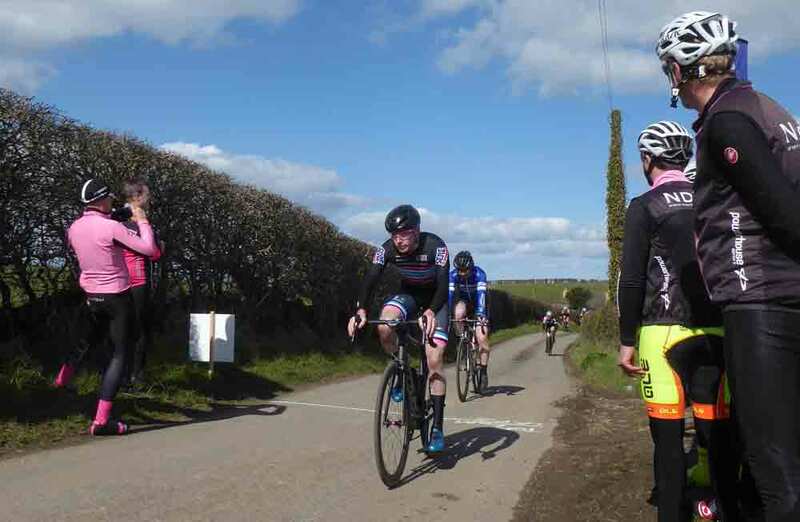 Darnell Moore (Caldwell Cycles) was a very worthy winner, hanging on just ahead of his 3 breakaway companions Conor McCann (Inspired Cycling), Lindsay Watson (Powerhouse Sport) and Craig Rea (Viner Caremark Pactimo) to take the flag. 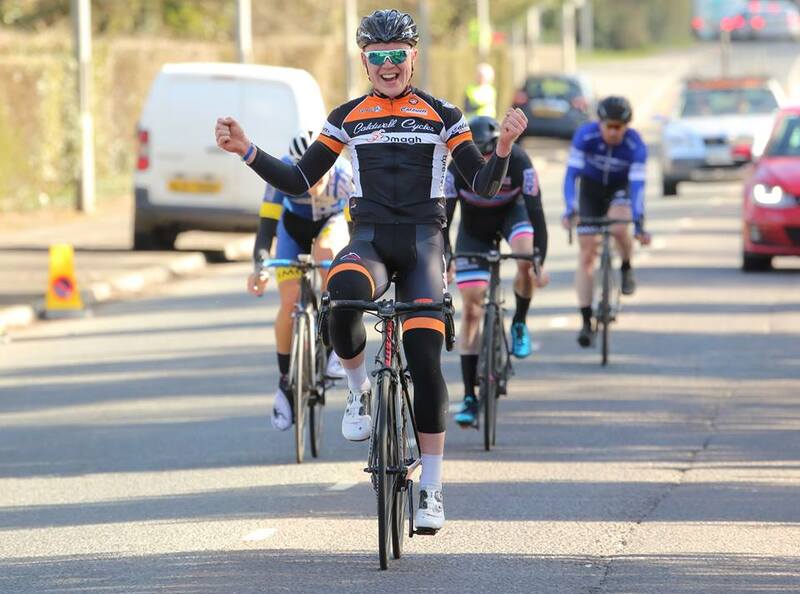 Angus Fyffe (also Caldwell Cycles) led in the rest of the breakaway groups 2-10 later, with the bunch a massive 7.37 down. 2 Conor McCann Inspired Cycling s.t. 3 Lindsay Watson Powerhouse Sport s.t. 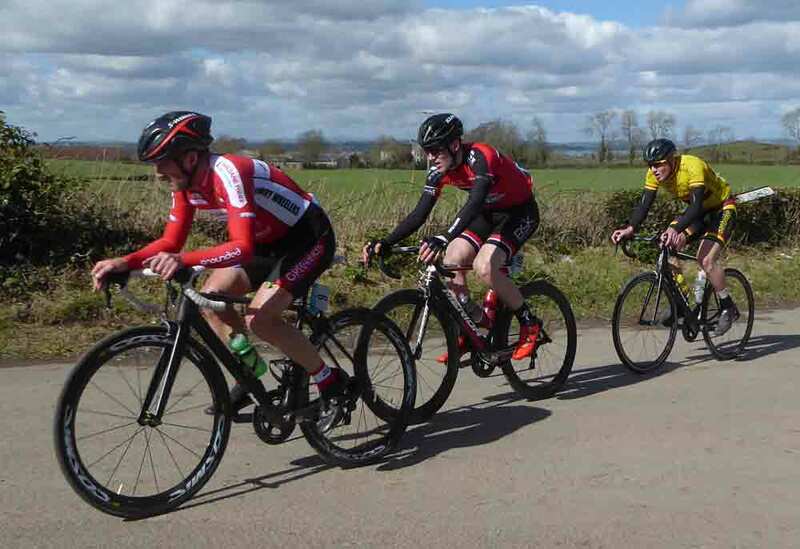 6 Alan Bingham Newry Wheelers s.t. 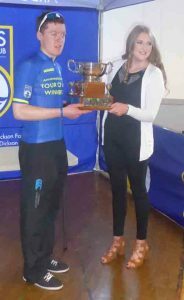 7 Bobby Kane Bann Wheelers s.t. 8 Liam Dolan Cuchalinn CC s.t. 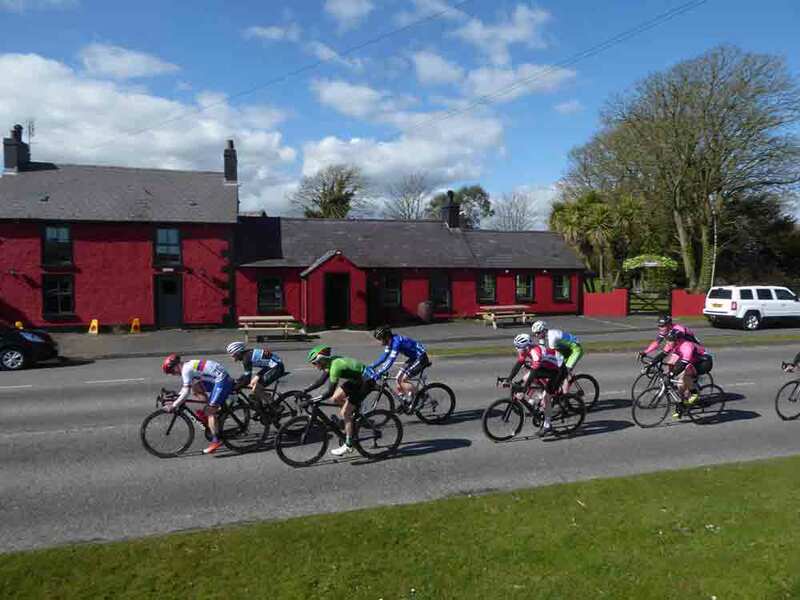 Chasing group on the Abbacy Road. Our sponsors – James Armstrong Auctioneers and Valuers, WIREFOX, Chain Reaction Cycles, Romas, The Belgian Project and Ray Brownfield. The Police, who supplied a control car and 7 police motorbikes. The 40 static marshals and 4 moto marshals, who helped to keep the race safe. Everyone who helped with the catering at the finish (and the start). The soup was great! 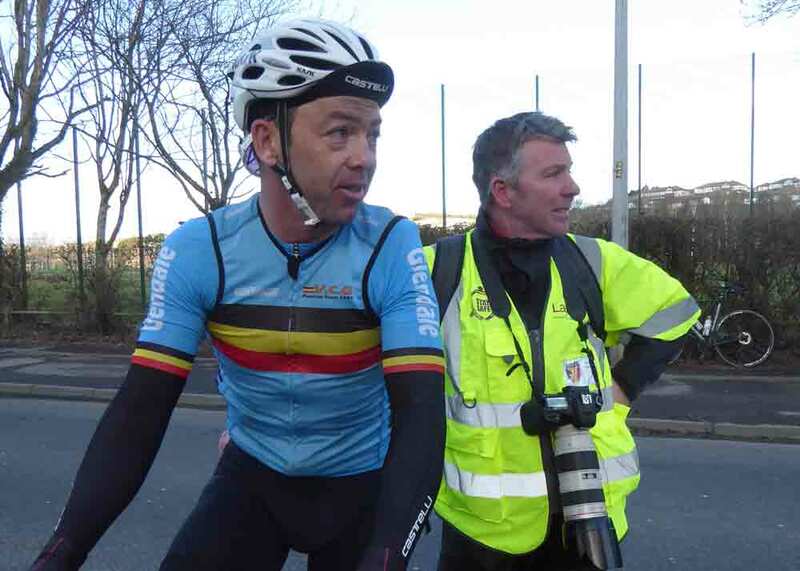 The commissaires – Aaron Wallace, James McLaughlin and Jack Watson MBE. Tommy Brown’s grand-daughter Lauren for presenting the legendary trophy. And all the riders and supporters. Here are some more photos from today’s race. The bunch assembles before the parade through Newtownards to the start. The riders pass historic Movilla Abbey shortly before the official start. 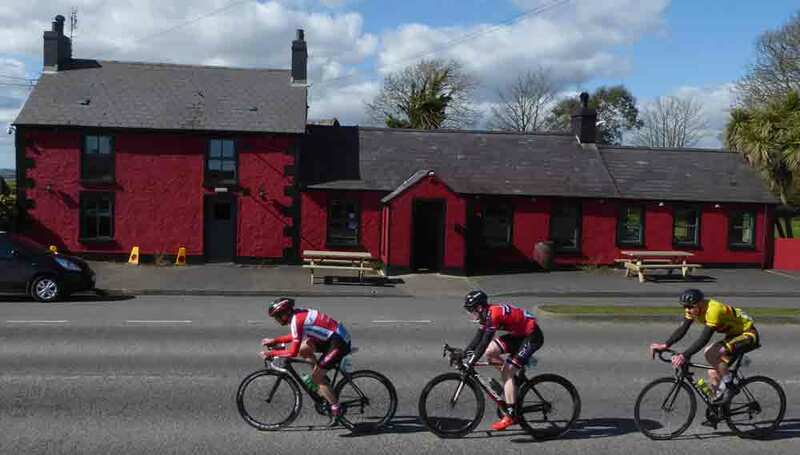 After 5 miles, three riders had already escaped and gained 15 seconds on the bunch at Ballyboley Corner. 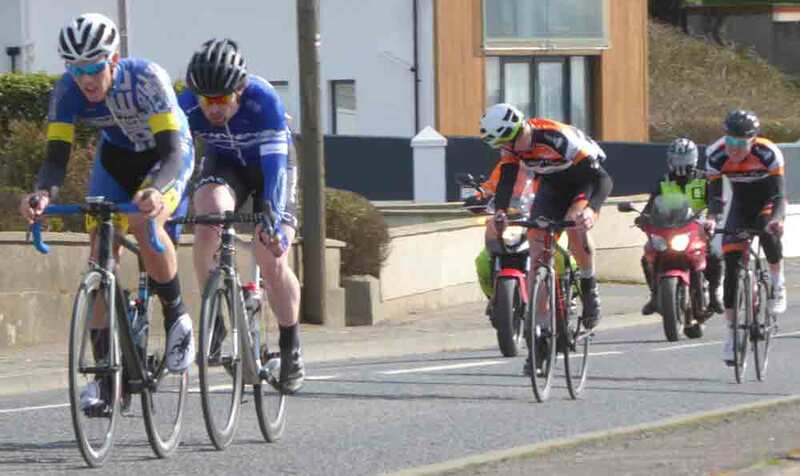 At Burr Point (the most easterly place in Ireland), the break has grown to 9 riders but they still have just 15 seconds. 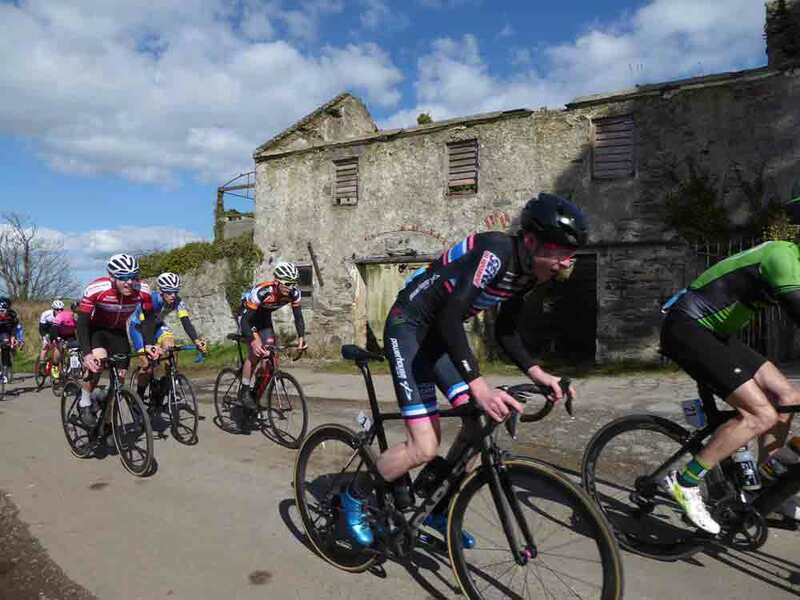 At Kirkistown, after 20 miles, the break has grown to 11 riders, and they have 40 seconds on the bunch. Lots of riders are active at the front of the bunch (above). First time past the Salt Water Brig the break had grown to 13 riders. These 3 have escaped the bunch and are trying to get across to the front. By the Mountain Road, our 3 chasers are still at 45seconds, but the bunch is now a further minute behind. 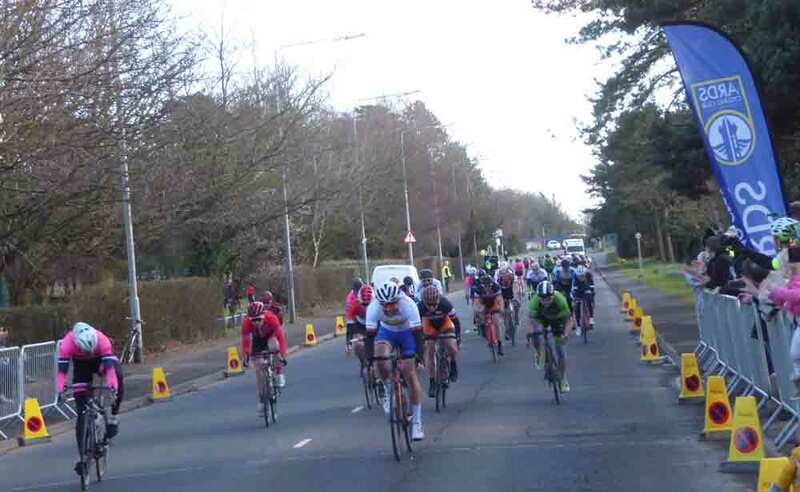 At Lough Doo Road, near the end of the first lap, the 13 man break are looking strong. 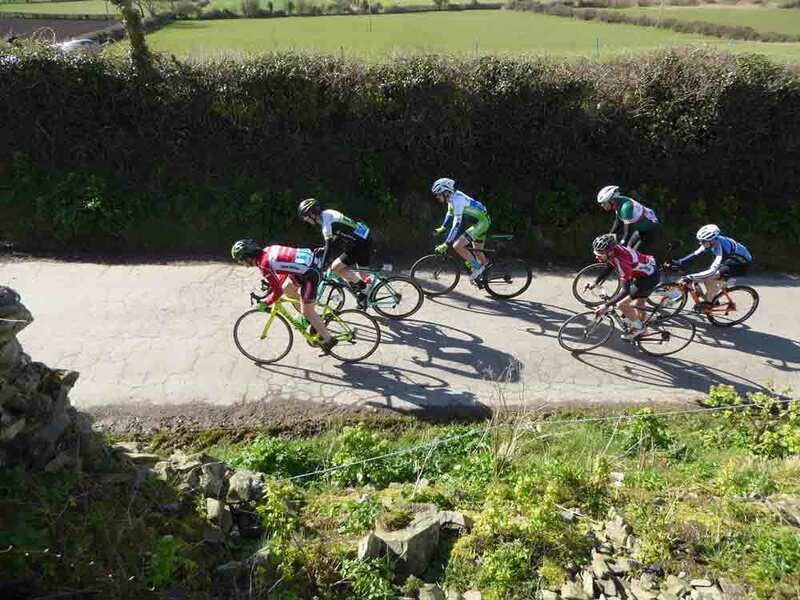 There are some small chasing groups, with the main bunch at 1:40. 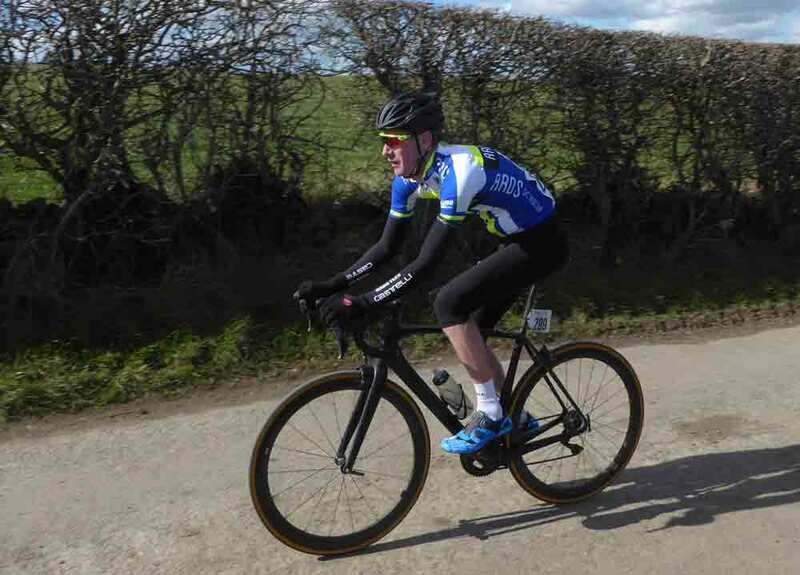 Andrew Hedley (Ards CC) looks comfortable at this stage, but unfortunately he punctured later. Lindsay Watson (Powerhouse Sport) was first over the top on the second climb of Mountain Road and took the KOM prize. The break now had 2:20 on the bunch, with various groups chasing in between. 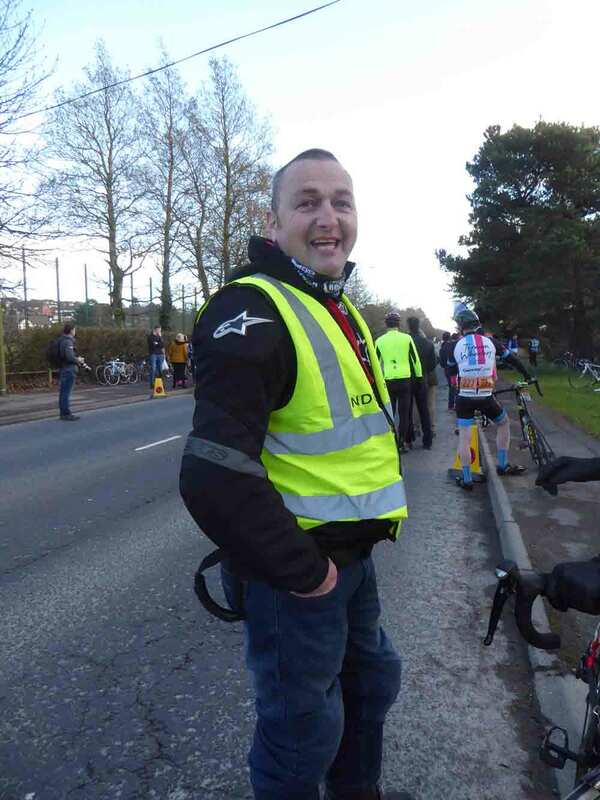 Club secretary Gareth Murray was still looking good at this stage, but unfortunately suffered cramp later in the race. 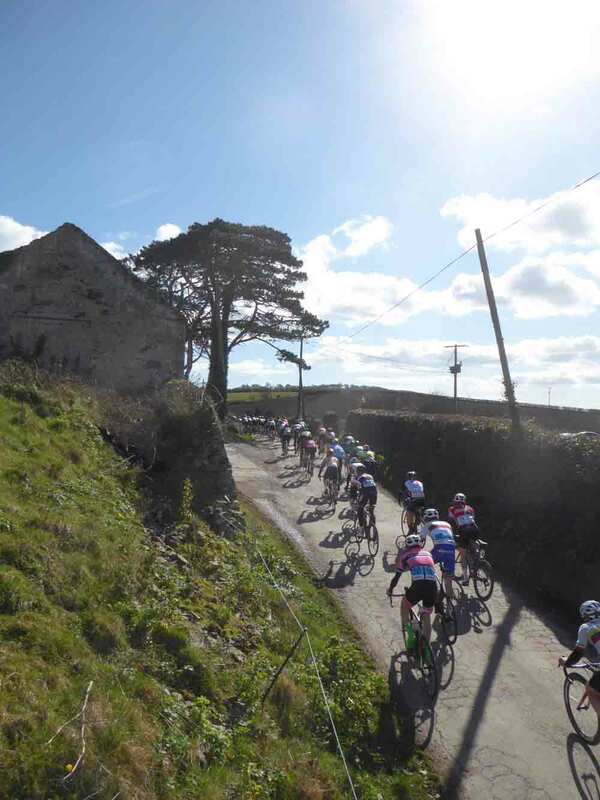 The main bunch is now 3:30 back, and looking like a snapshot from Strada Briancha in the spring sunshine. The leading group of 13 is starting to splinter as the eventual podium riders pile on the pressure on the homeward run through Kircubbin. 4 riders would escape, while the remainder of the break would be caught by the 10 man chasing group behind. Seven and a half minutes after Darnell took victory (see above), a revitalised bunch put on a great sprint show for 22nd place. Chris Richardson (VC Glendale) came in with the chasing group to take first unplaced vet. 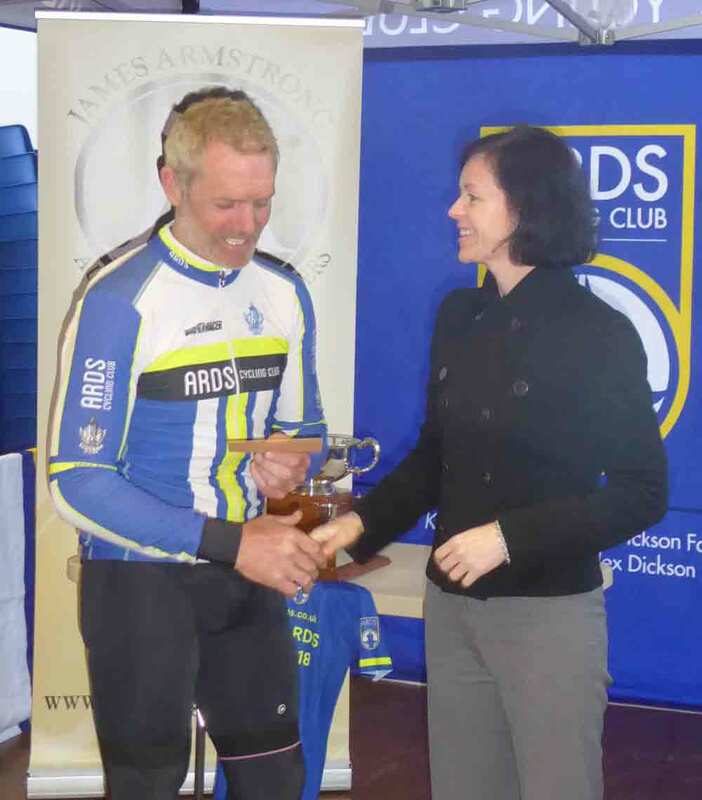 Robin Wilson took a very well deserved first Ards CC award. The police and all our static and motorcycle marshals did a fantastic job today to keep the race running smoothly and safely. Thanks to them, and to everyone else who helped out. We love this race! !